Guest Blog: A Mother's Journey "Rise Up"
It’s difficult to describe in words the many emotions or the day to day challenges of being the parent of a child living with a chronic autoimmune disease. 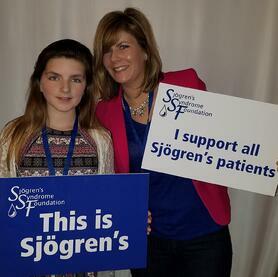 Life for us was forever changed when our daughter was diagnosed with Sjögren’s. Yes, I know. I had the same reaction. Say that again? How is it pronounced? Can you spell it? And then, the next logical question, can you fix it? The answer was no. Initially, we felt a sense of relief at least being able to identify the bully that has been picking on our daughter and be able to call it by name – Sjögren’s. We even walked out of the doctor’s office feeling hopeful the severe episodes that led to the diagnosis were just "one-offs" and moving forward with the prescribed disease-modifying drug would somehow return things to normal. I suppose some would call this the denial period. We could not have been more wrong. Then there is the feeling of isolation. A strange thing happens as time passes. The silence becomes deafening. I explain to myself that friends and family just don’t know what to say, so they say nothing. Perhaps they think it causes us pain to talk about it. Or maybe they tire of hearing things just aren’t okay. I really don’t know. My heart still longs to hear: "We are sorry you are going through this." "You are doing a good job." "You are doing your best." "This must be hard." Anything kind…anything at all. No matter how much time has passed, some spoken acknowledgment would rescue me from the deserted island we sometimes feel we are on. And while all of those feelings still ebb and flow and toss and tumble us, an inner strength has emerged, rooted in the deep love and respect we have for our child. It’s how we put on a reassuring face, whisper encouraging words, admire our little girl’s strength and determination and push for answers. We started doing research. We tried to "hack" what may have caused this and why our child? And still there are no answers and no solace in the research. Gradually, we realized that there is a new normal. And what was, will no longer be. We mourned. We mourned the loss of what was a carefree and energetic child. We mourned our helplessness and the powerlessness we felt that we don’t have the answers and we can’t fix what is wrong. We wish and wish that we could take our child’s place. She has her whole life ahead of her. Why can’t we take her place? I’d gladly take my daughter’s pain so that she could return to a "normal" childhood, one that wasn’t filled with medications, doctor’s appointments, waiting rooms, labs, chronic pain, fatigue, disappointments and fear. I don’t think we will ever reach the acceptance stage. Where are we now? 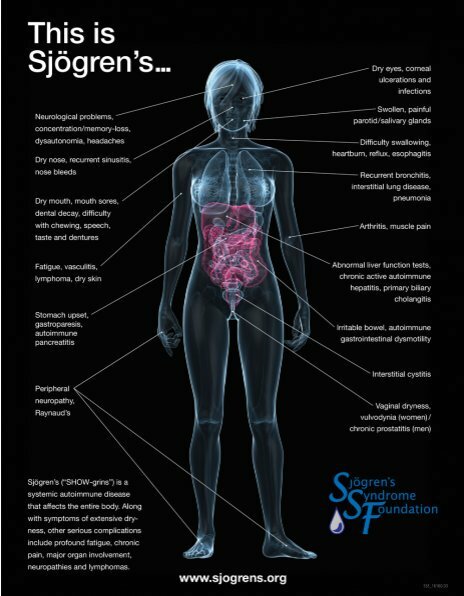 Sjögren’s is a complex disease that significantly impacts our lives. She experiences nerve pain for months on end that would render many adults unable to function, yet she perseveres and pushes on while we continue to partner with physicians to ease it. Our ‘normal’ now consists of a morning routine to help our daughter get of out of bed each morning. We deploy heating pads, massage and medication to help her painful joints regain something approaching normal motion. We talk about what she can and cannot do that day so that she can manage her pain or her crippling fatigue. Sometimes it’s a school day. Sometimes it’s not – often times, it’s not. Already, four months into the school year, she has missed a month of school for illnesses or doctor’s appointments. Remarkably, she is still an excellent student and has not fallen behind. We encounter top physicians who admit they are just now learning about Sjögren’s and confide that the treatments they are recommending have no science or research behind them. We, as parents, are forced to make decisions about medications with serious sides effects for which there are no long term studies. We weigh everything and ultimately decide that we would do anything to make her more comfortable, enjoy her day-to-day and do as much of what all the other kids are doing without hesitation. We try to remain optimistic that the medications are helping and slowing the progression of the disease and its numerous more serious complications. Essentially, we are guessing and performing trial and error to figure out what will work. Funny how your expectations can shift. We now wish for her to be happy above having good health. I continually voice my commitment to my daughter. I won’t stop advocating and I won’t stop searching for a treatment that works or for a cure. That’s why you see me on social media being as persistent as I am. I owe this to her. If I don’t fight for our little warrior, who will? This was originally posted on, Sharon Tiger Talks, where Sharon raised over $3,000 for the SSF on #GivingTuesday.